Guide to Houston Winter Festivals, Lights, and More! Welcome to the season after Halloween – Houston Winter! (Thanksgiving, who? )�I know, the stores can’t wait.� Winter decor was definitely a edging out the ghosts and ghouls. And, Hallmark? Wow, this is really their jam.� Christmas�movies�are�already on a 24/7 loop of Hallmark love and jingle bells.� I bet this is where Sabrina the Teenage Witch gets most of her residuals from.�Whether you are in the spirit, or not, it’s here!� This is definitely a situation where if you can’t beat them – join them!� What’s the worst that could happen? Your jolly might get out of control? To help you get in the spirit we have rounded up places around town where you can Deck the Halls, see the big man himself, shop ’til you drop, and all the other Houston winter wonderland-filled activities! Need somewhere to send the kids on the long winter break we’ve got you covered with a complete roundup of winter camp opportunities! Christmas in the Country at Dewberry Farms�(Brookshire) – Nov. 23 – Dec. 30, 2018 Fridays, Saturdays, and Sundays. Festival of Lights each evening and Day passes available for those just wanting trees. Holiday Acres�(Manvel) – Beginning Nov. 23, 2018 – Thursdays, Fridays, Saturdays only; 9 a.m. – 5 p.m.; Cut your own tree, hay wagon rides, animals, etc. They also host a Homeschool Day on Dec. 8th. Magical Winter Lights Houston (La Marque) – Nov. 16 – Jan 6, open Sunday – Thursday 5-10 p.m. and Friday & Saturday 5-11 p.m.�This year�s festival will feature six fascinating themed sections, interactive dinosaur�exhibit, acrobatic performances, carnival, and live entertainment. Merry Mansions Cookies & Cocktails, plus Holiday Lights Tour!�(Uptown) – Available on Saturdays and Sundays, with additional dates during the week leading up to Christmas, family-friendly guided tour through River Oaks, Merry Mansions exhibit, cookies, cocktails, & more! Moody Gardens Holiday Attractions�(Galveston): Nov. 17 – Jan. 6; Friday & Saturday 10 a.m. – 10 p.m.; Sunday – Thursday 10 a.m. – 9 p.m.; Moody Gardens is getting dressed up for the season.� Tickets vary and can be purchased as a combination or for single attractions.� You can look forward to Ice Land, lights, the regular attractions, plus seasonal attractions like the arctic slide, ice rink, and train. Old Time Christmas Tree Farm�(Spring) – Beginning Nov. 17 Choose and Cut your own Christmas Tree, 9 a.m. – 5:30 p.m. daily through Dec. 16 (except M-Th of Thanksgiving week); prices vary based on tree height.� Attractions such as Train, Slids and Bouce House are available by ticket ($3 each).� Take your own pictures with Santa on Saturdays, Sundays, and Thanksgiving Friday ($9). Santa’s Wonderland�(College Station): Nov. 9 – Dec. 30; Fridays 6 p.m. – midnight, Saturdays 3 p.m. – midnight, Sundays 3-11 p.m., Monday – Thursday 6-11 p.m.� Touted as THE Texas Christmas experience! Have a hayride through the woods (lights), food, Santa, live music, shopping, a mechanical bull, kids’ train, polar express, slides, toboggan chutes, campfire, petting zoo, and more. Snowfall at The Square�(Memorial,�Memorial City) -�FREE, Su – Fr 12-1 p.m. & Sa 4-5 p.m.�Every day starting November 23 through Christmas snowfall, live music, and lots of fun! Spring Creek Growers Christmas Tree Farm�(Magnolia) – Nov. 17 -Dec. 24, 2018, Open daily; Choose and cut your tree, prices vary.� Hayride and farm activities for the kids.� Santa visits on the weekends but does not take pictures. Breakfast with Sant dates are already Sold Out but there is a waitlist available. The ICE at Discovery Green: Nov. 16, 2018 – Jan. 21, 2019. Glide beneath the glittering lights of downtown Houston and embrace the holiday cheer on The ICE powered by Green Mountain Energy! The Ice Rink at The Woodlands Town Center: Nov. 17, 2018 – Jan. 21, 2019: A 21,000-square-foot permanent multipurpose facility features ice skating in a main room with lighting, a state-of-the-art sound system, tables for parties and concessions. Christmas in the Country at Dewberry Farms�(Brookshire) – Nov. 23 – Dec. 30, 2018 Fridays, Saturdays, and Sundays. Festival of Lights each evening and Day passes available for those just wanting trees. Holiday Acres�(Manvel) – Beginning Nov. 23, 2018 – Thursdays, Fridays, Saturdays only; 9 a.m. – 5 p.m.; Cut your own tree, hay wagon rides, animals, etc. They also host a Homeschool Day on Dec. 8th. Magical Winter Lights Houston (La Marque) – Nov. 16 – Jan 6, open Sunday – Thursday 5-10 p.m. and Friday & Saturday 5-11 p.m.�This year�s festival will feature six fascinating themed sections, interactive dinosaur�exhibit, acrobatic performances, carnival, and live entertainment. Memorial City Reindeer�(Memorial, Memorial City) – FREE, Eight-foot-tall reindeer will dance and prance throughout the mall; Nov. 30 & Dec. 1-2, 7-24 Merry Mansions Cookies & Cocktails, plus Holiday Lights Tour!�(Uptown) – Available on Saturdays and Sundays, with additional dates during the week leading up to Christmas, family-friendly guided tour through River Oaks, Merry Mansions exhibit, cookies, cocktails, & more! Moody Gardens Holiday Attractions�(Galveston): Nov. 17 – Jan. 6; Friday & Saturday 10 a.m. – 10 p.m.; Sunday – Thursday 10 a.m. – 9 p.m.; Moody Gardens is getting dressed up for the season.� Tickets vary and can be purchased as a combination or for single attractions.� You can look forward to Ice Land, lights, the regular attractions, plus seasonal attractions like the arctic slide, ice rink, and train. Old Time Christmas Tree Farm�(Spring) – Beginning Nov. 17 Choose and Cut your own Christmas Tree, 9 a.m. – 5:30 p.m. daily through Dec. 16 (except M-Th of Thanksgiving week); prices vary based on tree height.� Attractions such as Train, Slides and Bouce House are available by ticket ($3 each).� Take your own pictures with Santa on Saturdays, Sundays, and Thanksgiving Friday ($9). Santa’s Wonderland�(College Station): Nov. 9 – Dec. 30; Fridays 6 p.m. – midnight, Saturdays 3 p.m. – midnight, Sundays 3-11 p.m., Monday – Thursday 6-11 p.m.� Touted as THE Texas Christmas experience! Have a hayride through the woods (lights), food, Santa, live music, shopping, a mechanical bull, kids’ train, polar express, slides, toboggan chutes, campfire, petting zoo, and more. Spring Creek Growers Christmas Tree Farm�(Magnolia) – Nov. 17 -Dec. 24, 2018, Open daily; Choose and cut your tree, prices vary.� Hayride and farm activities for the kids.� Santa visits on the weekends but does not take pictures. Breakfast with Sant dates are already Sold Out but there is a waitlist available. The ICE at Discovery Green: Nov. 16, 2018 – Jan. 21, 2019. Glide beneath the glittering lights of downtown Houston and embrace the holiday cheer on The ICE powered by Green Mountain Energy! The Ice Rink at The Woodlands Town Center: Nov. 17, 2018 – Jan. 21, 2019: A 21,000-square-foot permanent multipurpose facility features ice skating in a main room with lighting, a state-of-the-art sound system, tables for parties and concessions. Dickens on the Strand (Galveston) – When downtown Galveston is transformed into the Victorian-era London of Charles Dickens! Holiday in the Park: The Spirit of Christmas�(League City) – Daily schedule: Movie in the park with free hot cocoa, parade, and activities. Parade of Lights (Cypress) -�The Texas Volunteer Firefighter Relief Fund (TVFFRF) is proud to bring its Annual Parade of Lights (POL) to Northwest Houston in the Cypress Fairbanks Area. Each year on the first Sunday of December. Holidays in the Plaza�(Sugar Land) – FREE.�6:30 pm���8:30 pm: Heart & Soul Ensemble Tomball German Festival Christmas Market�(Tomball) – FREE, check the schedule for specific events across the three-day festival. Christmas in the Park at George Ranch Historical Park (Richmond) Park open from 9 a.m. – 5 p.m. (Special holiday activity classes from 11 a.m. – 2 p.m.), explore holiday customs from the 1830s to the 1930s. Holiday Acres:�Homeschool Day�(Manvel) – Homeschool Day, 9:30 a.m. – 4 p.m.�� Hayrides, games, and more! Holidays in the Plaza�(Sugar Land) – FREE.�11:00 am���4:00 pm:�Holiday Dance Showcase Snowfest Parade�(Missouri City) – 9 a.m. Tomball German Festival Christmas Market�(Tomball) – FREE, check the schedule for specific events across the three-day festival. Holiday in the Park (Sheldon Lake SP) – 1-4 p.m., holiday games, geocaches, live music, and festivities! Tomball German Festival Christmas Market�(Tomball) – FREE, check the schedule for specific events across the three-day festival. Caroling and Cocoa in the Park (NW Houston, Burroughs Park) – 6-9 p.m., FREE Flashlight Candy Cane Hunt�(The Woodlands, Terramont Park) – 5:30 – 6:30 p.m., $10-15, for ages 5 & up. Flashlight Candy Cane Hunt�(The Woodlands, Terramont Park) – 5:30 – 6:30 p.m., $10-15, for ages 5 & up. Christmas in the Park at George Ranch Historical Park (Richmond) Park open from 9 a.m. – 5 p.m. (Special holiday activity classes from 11 a.m. – 2 p.m.), explore holiday customs from the 1830s to the 1930s. Flashlight Candy Cane Hunt�(The Woodlands, Rob Fleming) – 5:30 – 6:30 p.m., $10-15, for ages 5 & up. Magical Winter Lights Houston (La Marque) – Nov. 16 – Jan 6, open Sunday – Thursday 5-10 p.m. and Friday & Saturday 5-11 p.m.�This year�s festival will feature six fascinating themed sections, interactive dinosaur�exhibit, acrobatic performances, carnival, and live entertainment. Moody Gardens Holiday Attractions�(Galveston): Nov. 17 – Jan. 6; Friday & Saturday 10 a.m. – 10 p.m.; Sunday – Thursday 10 a.m. – 9 p.m.; Moody Gardens is getting dressed up for the season.� Tickets vary and can be purchased as a combination or for single attractions.� You can look forward to Ice Land, lights, the regular attractions, plus seasonal attractions like the arctic slide, ice rink, and train. Santa’s Wonderland�(College Station): Nov. 9 – Dec. 30; Fridays 6 p.m. – midnight, Saturdays 3 p.m. – midnight, Sundays 3-11 p.m., Monday – Thursday 6-11 p.m.� Touted as THE Texas Christmas experience! Have a hayride through the woods (lights), food, Santa, live music, shopping, a mechanical bull, kids’ train, polar express, slides, toboggan chutes, campfire, petting zoo, and more. The ICE at Discovery Green: Nov. 16, 2018 – Jan. 21, 2019. Glide beneath the glittering lights of downtown Houston and embrace the holiday cheer on The ICE powered by Green Mountain Energy! The Ice Rink at The Woodlands Town Center: Nov. 17, 2018 – Jan. 21, 2019: A 21,000-square-foot permanent multipurpose facility features ice skating in a main room with lighting, a state-of-the-art sound system, tables for parties and concessions. NOV. 30: City of Sugar Land’s Christmas Tree Lighting (Sugar Land) – 5-8 p.m.; FREE. The event will include performances, Mr. & Mrs. Claus, crafts, and more. NOV. 17 – JAN. 13: Houston Zoo’s: Zoo Lights�(Med Center) – November 17- January 13, $6.95 – $22.95 (closed December 24 & 25. Not included with zoo admission.) NOV. – DEC.: Christmas Katy -�The family incurred significant flood damage and will not be displaying this year. Hopefully, they’ll be back next year. NOV. – JAN.: Moss Lights -�The Moss Family is located in League City and puts their house on display Sunday – Thursday from 5:30-10:30 p.m. (11 p.m. on the weekends). The address is 540 Southhampton Lane, 77573. NOV. – DEC.: Schultz Holiday Lights -�The Schultz Family is located in Klein and puts their house on display Sunday – Thursday from 6:30-9:30 p.m. (10:30 p.m. on the weekends). NOV. 22 – JAN. 1: Chrismas Ranch -�Christmas Ranch is a drive-through light display in Cleveland, TX.� It is free but donations are appreciated and all proceeds are distributed by St. Mary’s Catholic Church to helping needy families within the community. The hours are Sun. – Thurs 6-10 p.m. Santa visits Dec. 8, 15, 22, and 24 from 6-8 p.m. NOV. 22 – JAN. 2: River Oaks -�If you head toward the street around the River Oaks Country Club you will see some amazing displays and huge oaks robed in lights. Generally, nightly 6-11 p.m. (some lights will stay on until midnight).� There will be heavy traffic on Saturdays and the heaviest route is from Kirby going west on Del Monte. NOV. 23 – JAN.1: Sugar Land Holiday Lights – Hosted at Constellation Field it will run Sunday-Thursday from 6-9 p.m. and Friday-Saturday (plus Christmas Eve, Christmas, New Year’s Eve, and New Year’s Day) from 6-10 p.m.� General admission is $14 per person, a $3 discount for military, seniors, children under 4, and groups of more than 10. NOV. 23- JAN. 1: Edwards Family Lights�-�The Edwards family is in Scarsdale and puts on an extravagant show.� 5:30-10 p.m. weekdays & Sunday, 5:30-11 p.m. Fridays & Saturdays. NOV. 24 – DEC.:�Johnsons Christmas Corner– This family might have the Griswald’s beat.� This is a one house stop but they are completely decked out, have themed days, and regular visits from Santa (follow them on�Facebook�or Twitter to get tips for when he’ll show). The address is 14811 Cypress Meadow Drive, 77429. NOV. 24 – JAN. 1: Downtown Galveston Lanterns & Lights -�Stroll near Saengerfest Park to view the illuminated Christmas Trees and decor.� A giant snowglobe will be available Nov. 25-26 & Dec. 9, 16, & 23 for holiday photos! NOV. 24 – DEC 23. :�Dickinson Festival of Lights�- Celebrating their 19th Anniversary�� A Walk-thru Event at Paul Hopkins Park � With Free Admission, Parking and Shuttle Service. Open Nightly from�November 26th Thru December 30th, 2016,�6�8:30 p.m. (Weather Permitting). NOV. 30 – DEC. : Pecan Grove Subdivision -�Lights will be on daily from dusk to 11 p.m. (midnight on weekends).� Travis High School uses this as a fundraiser and previously provided hayrides through the lights, check out their website for updates and to buy tickets. Plantation Drive is the main drag, but previous lighting contest winners were located on�Morton League, Austin Colony, and Quarterpath as well.� You may consider parking at Pecan Grove or Austin Elementary School and walking through the neighborhood. DEC.: – Dodd Family Holidays -�This family is based in The Woodlands and has their lights set to music (broadcast to 95.1 FM.� The hours are Sunday through Thursday, 6-10 p.m. (Friday and Saturday until midnight).� The address is 62 W. Knightsbridge Dr., 77385. DEC.: Franck�s Christmas Light Show�-�The Franck family runs their light show nightly from 5:30-10 p.m. (10:30 p.m. on the weekends).� The lights are timed to music which is broadcast on� 89.7 FM and lasts about 45 minutes.� The address is�15923 Viney Creek. DEC. 1: Christmas Fair (Huntsville) – 10 a.m. – 5 p.m.; Train rides, snow, pictures with Santa and more! DEC. 3: Giant Menorah Lighting Celebration (Sugar Land) – 6:30-8 p.m.; FREE. Celebrate Chanukah with the lighting of the giant menorah in the Sugar Land Town Square. There will be music, dancing, performances, and more. DEC. 8: Lights in the Heights – The event will take place on Dec. 9 and due to road closures it is a public event, but please be mindful that this is a neighborhood (be respectful of their property and families).� While the event is open to the public individual events at homes are private.� If you just want to see the lights we recommend coming after the event to just drive the streets and see the displays and lights. DEC. 8: Pearland’s Tour De Lites – Family Bicycle Ride begins at 7 p.m. at Shadycrest Elementary and goes through the Green Tree Subdivision to view the Christmas lights. Registration and check in for the ride ends at 6:30 p.m. Besides the event, Green Tree Terrace is a good destination most nights during the season to drive through and look at lights. DEC. 8-30: Preston Woodforest Nite of Lites�- This Northwest Houston neighborhood goes all out.� The neighbors band together to create themed light displays.� It is truly an amazing trip.� The later in the season the more traffic you should expect, check out their visitor map to plan your drive. DEC: Spring Shadows – This neighborhood is north of I-10 and east of Beltway 8.� There will be police to help traffic flow but expect long lines the later you go in the season. Nov. & Dec.:�Photos with Santa (Sugar Land) – 1-5 p.m.; FREE; Several dates: Nov. 25, Dec. 2, 9, & 16. The photos will take place in the lobby of 16190 City Walk at the Sugar Land Town Square.� They will be collecting new unwrapped toys. Nov. & Dec.: Skate with Santa (Downtown,�Discovery Green) – Saturdays, 5-6 p.m. Nov. & Dec.: Spring Creek Growers – Several dates he will visit the farm. Waitlist available for Breakfast with Santa. Nov. 17 – Dec. 16: Old Time Christmas Tree Farm�(Spring) – Take your own pictures with Santa on Saturdays, Sundays, and Thanksgiving Friday ($9) – Nov. 17 – Dec. 16, 2018. Dec.� 1: Photos with Santa by John Daughterty Realtors,�(West U, Bellaire, Briargrove Park, Heights)�10 a.m. – 1 p.m. Dec. 2: Santa Cares (Memorial City) – Sensory-friendly Santa visits, Free but reservations required. Dec.� 8: Photos with Santa by John Daughterty Realtors,�(The Woodlands)�10 a.m. – 1 p.m. Dec.� 8: Photos with Santa and Paws by John Daughterty Realtors,�(Heights)�10 a.m. – 1 p.m. Dec. 9: Santa Cares (Memorial City) – Sensory-friendly Santa visits, Free but reservations required. Dec. 15: Breakfast with Santa�(Medical Center,�Houston Zoo) – 8 to 10 a.m., members only. $25-35 per person. – SOLD OUT Dec. 15:�Breakfast with Santa (The Woodlands) – Dec. 15, 10-11:30 am; $40/Family of Four; $45/ Family of Four Non-Resident; $8 Each additional family member ; Registration required. Dec. 15:�Gingerbread House Making with Santa (The Woodlands) – Dec. 15, 1-2:30 pm; $20/Resident; $25/Non-Resident; $5 Sibling Discount; Registration required. Decorate cookies with Santa. 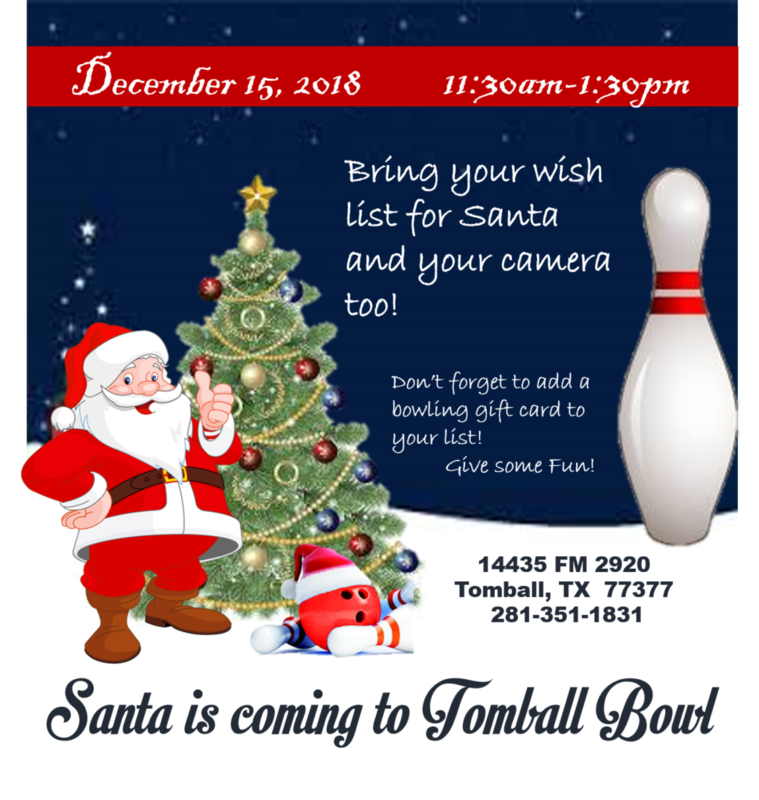 Dec. 15: Santa is coming to Tomball Bowl,�11:30 a.m. – 1:30 p.m. Dec. 21:�Santa�Social (The Woodlands) – Dec. 21, 7-9 p.m.; $40 Resident Family of Four; $45 Non-Resident Family of Four; $8 each additional family member; Registration required. Dec. 22:�Breakfast with Santa (The Woodlands) – Dec. 22, 10-11:30 am; $40/Family of Four; $45/ Family of Four Non-Resident; $8 Each additional family member ; Registration required. Dec. 22:�Milk and Cookies with Santa (The Woodlands) – Dec. 22, 1-2 p.m.; $15 Resident, $20 Non-Resident; $5 Sibling Discount; Registration required. DEC. 17: Santa’s Workshop -�(The Woodlands) – Dec. 17, 3-4:30 pm;�$20 Resident, $25 Non-resident, $5 sibling discount; Registration required. Build small toys with Santa. There are so many great markets around Houston check out our complete list in the link to plan your holiday shopping adventures! Check out individual events on our Community Calendar.